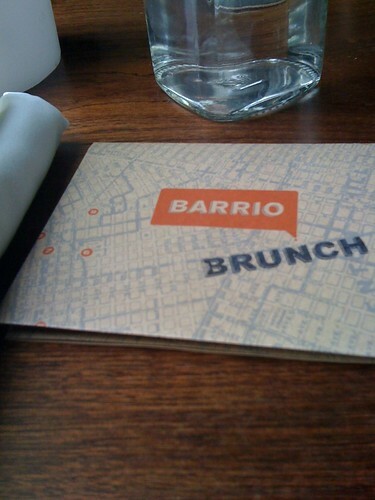 Today I had Brunch at Barrio restaurant in Seattle. I have been to Barrio once before for dinner and it was pretty good, so when I was told their Brunch was really good I decided to try it out. I ordered the Breakfast Taco. It is served make-your-own fajita-style, which I really like. 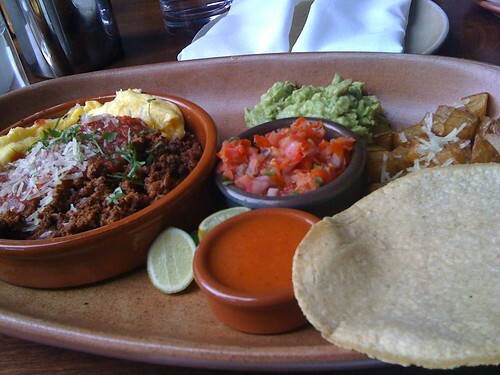 It is served with tortillas and includes scrambled eggs, housemade chorizo, habanero salsa, Manchego cheese, guacamole, fresh tomato salsa, and house hot sauce. You also receive a side of fried potatoes. I really liked the Breakfast Tacos. Lately I have been really loving chorizo and Barrio's homemade chorizo is very tasty. I like the make-your-own style tacos. That way you can put as little or as much of the ingredients as you wish. The scrambled eggs were cooked perfectly and the hot sauce had just enough kick to wake me up. If there was one thing I had to choose that I didn't like, it would have to be the fried potatoes. I like my fried potatoes to be crispy, but these fried potatoes seemed to be a bit under-cooked. A nice touch to the meal were the three little slices of lime that were just the right size to squeeze some fresh lime juice on each breakfast taco. The Breakfast Taco meal costs $13.00, which I feel is a fair price for the amount of food you get, and the meal is pretty filling. The service at Barrio was excellent. Our server was very attentive, but wasn't over-bearing. I will definitely go back to Barrio for Brunch.